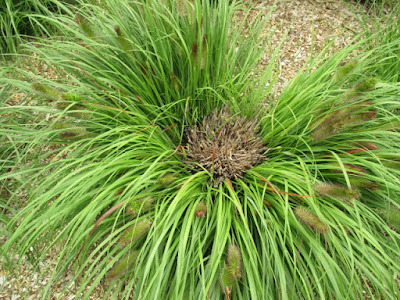 Flowering fountain grass with a dead center at the MN Landscape Arboretum. 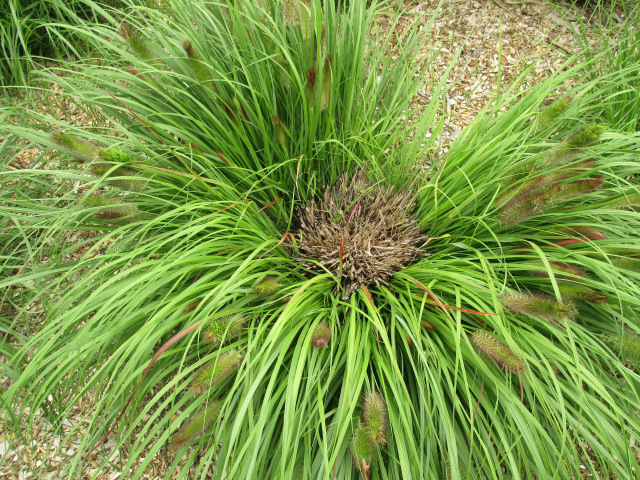 What's wrong with this fountain grass? Meyer says the winter cold killed the center, proving it is not a reliably winter hardy grass in Minnesota. Also, Meyer has a warning for home owners. She's observed the grass can self-sow and grow into a lawn where it's very hard to kill. 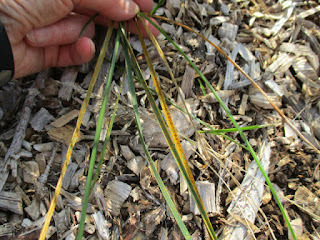 Orange postules on yellow blade of grass in the center. Have you ever noticed your shoes turning orange? You may have walked on perennial ryegrass that has rust--orange pustules on these Kentucky bluegrass blades is common in August. While not usually fatal, rust can turn an entire plant tan or brown and weakens the plants. Keep foliage dry, avoid overhead watering and improve air circulation around plants to avoid rust. 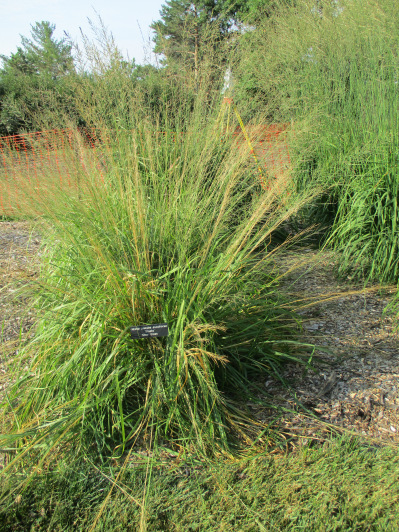 Big and little bluestem and ‘Karl Forester’ feather reedgrass also get rust. 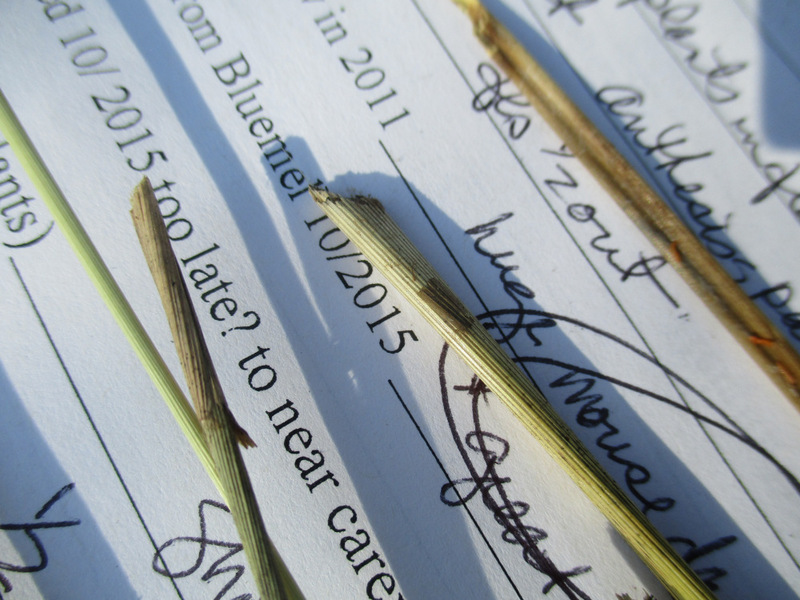 Recently, I am finding many yellow stems and flowers on Molinia (tall mooregrass) and Sporobolus (prairie dropseed). These yellow stems come out easily from plant and with close examination, I find the stems are cut off…mice damage in the summer! Mice are living in these bunch grasses and having a good time, eating the base of the plant while protected with the dense arching foliage (see photos below). 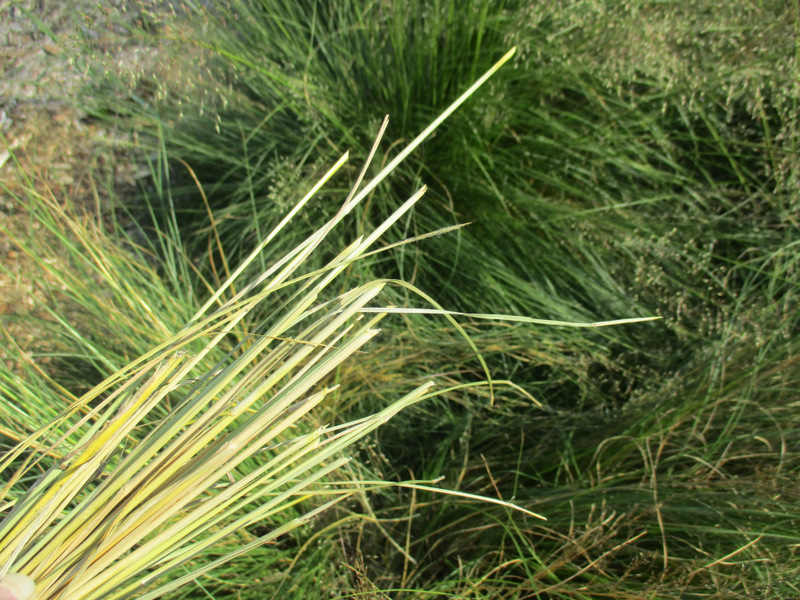 While most home gardens may not have enough grasses to attract mice, if you notice dead stems in your bunchgrasses, examine the plants closely. Try to hand come or remove the dead stems. If the stems come out easily, look closely at the bases for a sharp angle cut on the stem. Mice easily cut of the stems and eat a portion of the stem, and then move on to the next juicy stem. Can we set traps in a public garden or should we use bait? With visitors in the grass collection, we may be better off with hidden bait. When I see mice scurrying from one plant to another, I know they are having a party in the Grass Collection. Time to take action!